How to create a Rental Agreement in Punjab? Punjab is undoubtedly progressing with so many exciting opportunities. It is one of the outstanding states in India, contributing over 3.17 lakh crores in terms of Gross State Domestic Product (GSDP). There’s an IT boom happening in Mohali, the textile industry in Ludhiana is better known as the “Manchester of India” and Batala was previously called the “Iron Bird of Asia” as it was well known for pig iron castings. Apart from this, there are so many agro-based industrial and related machinery units, chemical units, power generating industries etc. and all working in tandem with each other to put Punjab on the global map. If you have recently moved to any of the happening cities of Punjab, then you must be looking for a decent place to stay. What better way other than having a legal contract specifying all of the terms and conditions of a rental agreement between a landlord and a tenant for renting out or leasing a place of your choice. Generally, it’s always better to know what all clauses go into a rental agreement. Draft the document after discussing the clauses between the landlord and the tenant. Print the document on a Stamp paper of recommended value after reviewing it. The document must be signed by the landlord, the tenant and two witnesses. The document having a validity of more than one year must then be registered at a local Sub-registrar office. This procedure has to be followed to create rental agreement in Chandigarh, Amritsar, Ludhiana, Mohali, Bathinda, Batala and other places of Punjab. To provide for the regulation of rents, repairs and maintenance and eviction relating to premises and matters connected therewith in the State of Punjab. The landlord and the tenant should mutually discuss clauses agreeable by both. Once the satisfaction levels are reached, the same can be drafted by a lawyer and printed on Stamp paper of valid denomination. You can also quickly draft your rental agreement from our dedicated rental agreement forms for various states by selecting your state from the drop-down menu. Premises which were let out before implementation of the Act. Premises held by the State or Central Government or a local authority. Premises belonging to an international organization, an embassy, High Commission or rented out to any of the foreign nationals. Premises belonging to religious, charitable or educational trusts specified by the State Government. Premises let out by the Punjab Urban Development Authority to a lessee or sublessee, by way of an agreement of hire-purchase, lease or sub-lease with the concerned party. Non-Residential Premises shall be allowed to be rented through Contract renting. Such premises shall be governed by the conditions of the contract, and lawsuit or prosecution under any other law or circumstances shall not be permissible. A landlord, if found violating the contract, shall not be entitled to the receipt of rent, for the said months in question. A tenant, if found violating the contract, shall be liable to pay double the rent for the said months in question. The rent payable for the premises is to be decided by the landlord and the tenant, provided that the agreed rent is going to be increased by five percent for the last monthly rent charged over a period of two years and that the third year shall be increased by the increase in Consumer Price Index over the corresponding three years. With or without the approval of the tenant, the landlord has the right to revise the rent if he has incurred expenditure for any improvement or structural alteration done to the premises. The landlord can increase the rent to a maximum of ten percent of the rent of the premises per year in such cases. A property let out by a widow or her husband before his death. A property let out by a handicapped person. A property let out by a senior citizen of age 65 years or more. A property let out by a freedom fighter, his widow or dependent children. A property let out by a NRI can apply to the Rent Authority for possession. Giving more teeth to landlords whose property has been illegally occupied, removing such tenants in question is a breeze now. 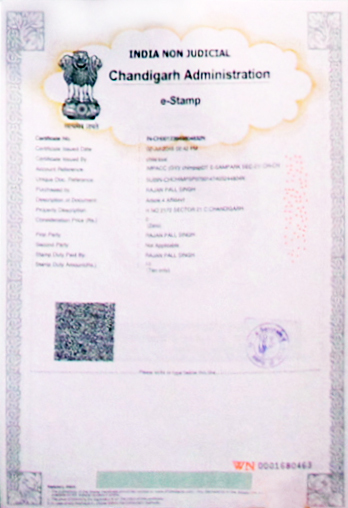 From January 2015, the Punjab government has introduced the feature of e-Stamping. Citizens can now quickly access the services without any hassles of middlemen or excess amount of Stamp paper being purchased for non-availability of Stamp paper of required denomination. However, this feature remains largely untapped by the population and they still get their works done the traditional way. Forging the document and subsequently pulling off a fraud becomes difficult, as the authenticated document is in the public domain. Any matter related to family feuds, debts and so forth becomes visible. Thus, making the entire document clearer to a prospective purchaser of that property. It shows that the document was signed by the concerned parties and brings clarity with regard to the clauses which deal either with the landlord or the tenant. Any Government issued ID proof, like Aadhar card, Driving Licence, Voter’s Id, PAN card etc is required. If the person is a foreigner, then his/ her original passport is required. If the tenant is a registered Company, then a board authorization letter from that company, along with the company’s seal is required for registering the lease document. The Power of Attorney should be presented if one person is representing another person for registration. 11-Month Tenancy Agreement – Being one of the widely used contract types all over the country, this is easily drafted without any registration owing to the short duration of time. Commercial Lease – Registration and notarization of these type of contracts for business and commercial ventures between a landlord and a company or two companies are always carried out. 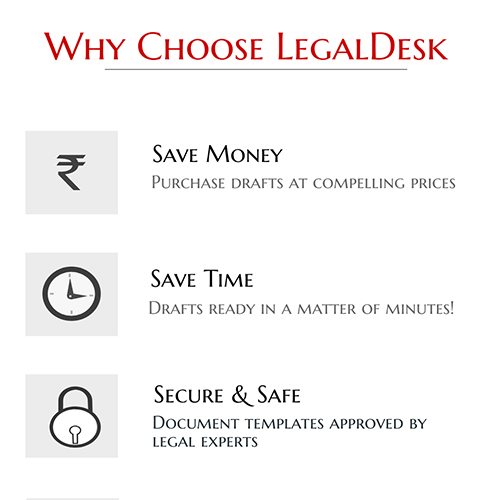 Generally, the deed is drafted in such a way that it suitably caters to the requirements of all the parties involved. Long Term Lease – Long term leases involve a large lump sum paid upfront to the landlord instead of payment of monthly rent. This is generally carried out for residential purposes only. Open our pre-drafted online rental agreement by clicking the button below. Fill in details of the landlord, tenant and the details of the property in the custom fields and from then on customize the document as per your unique requirement. You can either print the soft copy or opt to let us print it on Stamp paper and deliver it to an address of your preference.